How are cities being fearless when it comes to its immigrant and undocumented citizens? Is San Francisco calling itself a Sanctuary City enough, or how can we change our city to be fearless in the face of xenophobia? 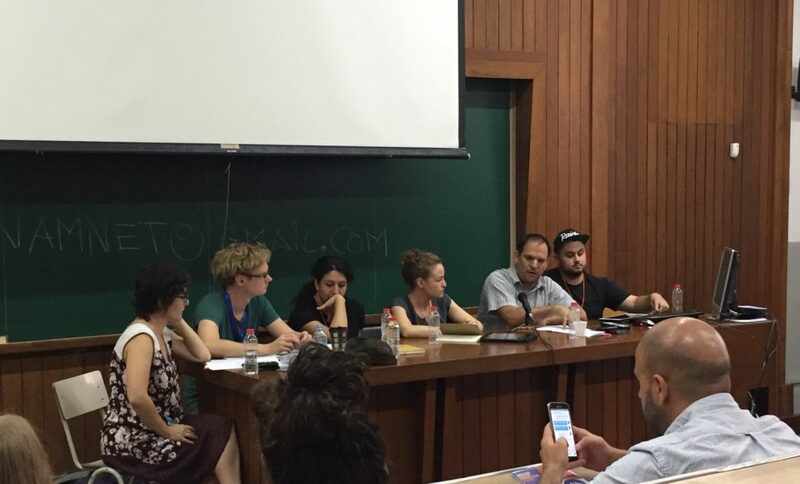 A policy roundtable entitled Sanctuary and Refuge Cities was presented on the last day of the Fearless Cities Summit by Xristina Moschovidou (Kilkis, Greece), Ignasi Calvó (Barcelona, Spain), Liora Danan (New York City, U.S.A.), Daniel Gutierrez (Berlin, Germany) and Amélie Canonne (Paris, France). Though coming from five very different regions, the overarching theme was that there can’t be parallel systems in place inside a single municipality. When we construct a separate system for immigrants within an existing system that is built to exclude them, we aren’t creating actual solidarity. Instead, the system needs to be rebuilt so that the same basic public services (legal services, healthcare, public safety, education, etc.) are accessible on the same level for every citizen. And these services need to be genuinely accessible for all – what’s the point of providing access to healthcare if patients can’t communicate with their doctors? Once emergency needs are met for new citizens, how can we continue supporting them to ensure they thrive alongside existing members? For example, are helping them find jobs and forging relationships with unions for economic solidarity? Most importantly, we need to ensure there are entryways available for new citizens to be involved in policymaking and decision making, regardless of documented status. It’s time to stop talking about immigrants and start talking with them. The title of Sanctuary City is a slight misnomer considering local municipalities can’t provide full protections against federal policy, including ICE raids against our neighbors. Even as recently as a week ago, members of our chapter attended a rally to stop the deportations of Hugo Mejía and Rodrigo Núñez, two gentlemen who were recently detained by ICE in a neighboring area. While we may not have the powers in place to stop these events, we can and will continue to show fearlessness and solidarity with our immigrant and undocumented neighbors as we work to build a truly fearless and welcoming city in San Francisco.